Whenever we go out to dine, we inevitably think about home cooking. Not that we wouldn’t enjoy a nice night out on the town and enjoy the pleasures of dining with friends or the experience of exploring new flavors just purely for the sake of it, but we can’t help it but to always think how we can re-create a dish or use these flavors back in our own small kitchen. We just enjoy cooking that much. When we taste a great dish, a typical conversation might go like this: “wow, this is really good!” Followed by “we can definitely do this at home!” And quickly followed by, “and for so much cheaper!” Or “yeah, fish sauce would be great with this!” Of course we have the utmost respect for Chefs and their creations and don’t say these things to belittle what they do. But if imitation is the sincerest form of flattery, then inspiration is right behind it as we are often inspired by dishes we eat. Here we have two versions of an easy tarte flambe, which is a French Alsatian dish that is flamed baked (hence the name) resembling a thin pizza. 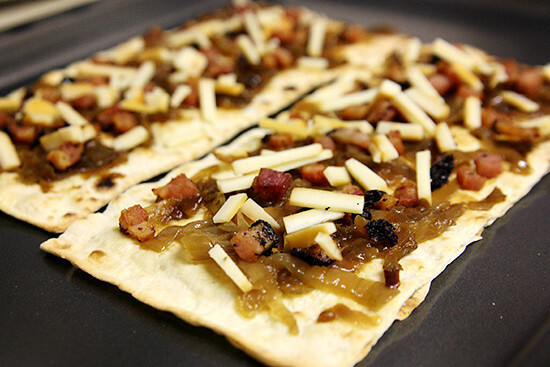 The traditional tarte flambe consists of sliced raw onions, creme fraiche, and lardons. In Los Angeles, the most famous tarte flambe was created by Walter Mantzke, formerly of Church & State. After tasting his tartes at his restaurant and at the Pebble Beach Food and Wine Festival, we were inspired to create our own easy tarte flambe using ingrediants from the traditional tarte as well as a smoked salmon version. 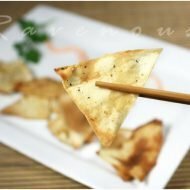 This is not so much a recipe, but more like step wise instructions on how to create your tarte using our favorite flat bread, lavash bread. Use as much or as little of the garnishments as desired. Lavash, as we have posted before is a flat Middle Eastern bread, much thinner than a pita. You can find them in Middle Eastern markets or even on Amazon. Preheat oven to 400 degrees. Cut your lavash bread into rectangles of desired size and score in quarters for easier cutting if desired. Brush light coating of olive oil and place on baking tray. Pre bake the lavash until crispy but not yet browned for about 4-5 minutes. Remove and spread the caramelized onions, gruyere, and bacon liberally. Return to oven and bake until lavash is golden brown, another 4-5 minutes or so. Allow to cool slightly and add freshed cracked pepper. Slice with pizza slicer and serve. 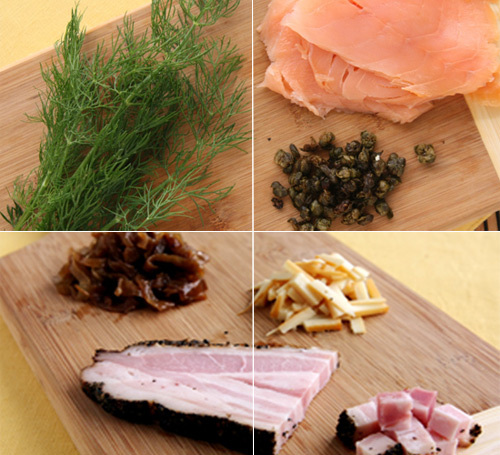 Repeat the same technique as above except layer on the smoked salmon and capers and return to the oven. Add the dill and drizzle creme fraiche/Mexican crema after final baking. 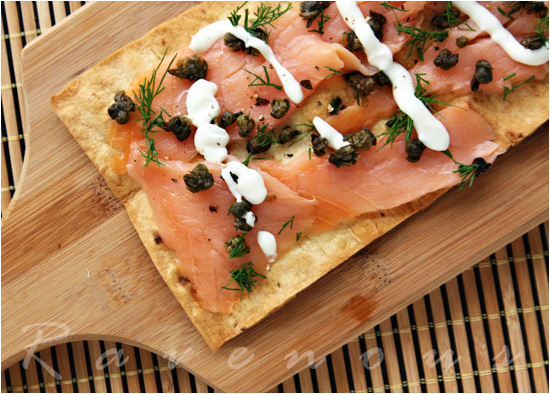 This version is fantastic for Sunday brunches with a crisp glass of white wine or champagne. 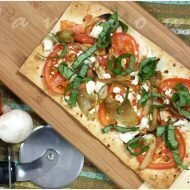 The beauty of these easy lavash bread tarte flambes is that you bake a large sheet ahead of time and it will stay crispy. When guests arrive toss on the toppings and heat in the oven until edges are brown and in minutes you’ll have an appetizer that your guests will think you’ve spent hours on. Feel free to experiment with your own personal favorite garnishments. We’ve served these to friends who have tried the original tarte flambe at Church & State and while it wasn’t a blind taste test, the reviews were a big thumbs up. Thanks, Chef Mantzke for the inspiration! Needless to say, in these economic times, it’s nice to know you can create gourmet dishes for mere dollars when you don’t have time or money to try the original. 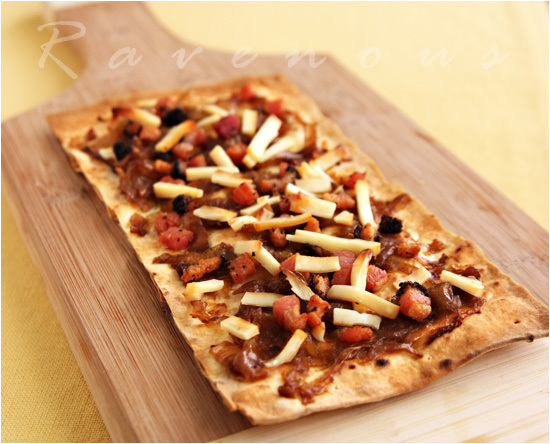 Try this easy tarte flambe recipe out and we’re sure this will be an easy go to appetizer for any occasion! What a great recipe! The pictures look simply stunning. Oh my – this I want… I love savoury tarts – and to put in on lavosh is so simple and inspired. We often do that too – we can cook anything =P caramelised onions anything for me! I love that you offered two very different variations. Both look great and are so easy to make! Or "yeah, fish sauce would be great with this!" I had to laugh, because this sometimes comes up whenever I am trying to tweak a recipe. I think it's a versatile ingredient. The Alsatian tart looks similar to something I make at home, which I can attest is very good! Oh, I'm thinking this would be great for an upcoming wine tasting party. Is there something else I could substitute for the lavish bread? btw, love your blog! I just love how you guys shared your sentiments on translating a dine-out meal to home and how fish sauce can make everything taste good. Ditto to that! It's similar to the ones at your party. Those were great!